Learn how to create paychecks in QuickBooks Desktop Payroll. Do you need to create a paycheck in Desktop Payroll? We show you how. There are three types of paychecks in QuickBooks Desktop Payroll: unscheduled, scheduled, or termination paychecks. Before creating or running paychecks for your employees, look over the following checklist. Download the latest tax table . Download the latest QuickBooks Desktop release. Set QuickBooks Desktop to Single-user mode. Enter employee withholding information (W-4) into QuickBooks Desktop (normally done when you initially set up your employee). If you want to pay employees through Direct Deposit, set up employee direct deposit information in the employee profile. Create paychecks in the same company file where you have been creating paychecks. If you are a Direct Deposit or QuickBooks Desktop Payroll Assisted customer, the Process Payroll On date is adjusted to include transmit lead times and federal holidays. We recommend you use this option if you don't pay your employees regularly. Or if you pay them an off-cycle paycheck, bonus paycheck or commission paycheck that isn'y integrated with their normal payroll. Use this option to pay a released/terminated employee's last paycheck. This process assists you in creating a final paycheck, entering the employee's release date and marking them inactive (optional). For Assisted Payroll use the termination paycheck option to create a final paycheck for the same day without getting a late fee. See Create Termination paycheck or Processing a late payroll (backdating paychecks) for steps to run or create a termination paycheck. Step 1: Choose the type of payroll check you need to create. Select Employees, then Pay Employees, and select from the check types Scheduled, Unscheduled, or Terminated checks. Scheduled Payroll: QuickBooks Desktop will take you to the Payroll Center and Pay Employees tab. From the Create Paychecks section, select the appropriate schedule. Select Start Schedule Payroll button. QuickBooks Desktop will open up the Enter Payroll Information window. 2. Verify the Pay Period Ends date, Check Date and Bank Account the monies are drawn from. Step 2: Choose the Printing Option that applies to you. Click Print paychecks on check stock to queue paychecks for printing from QuickBooks Desktop. Click Handwrite & assign check numbers if you're writing your paychecks by hand outside of QuickBooks Desktop. Enter a First Check#. When you enter a check number, the number will increase by 1 for each subsequent check written from the account specified in the Bank Account field. 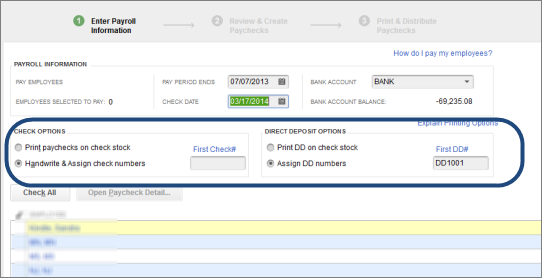 Click Print DD on check stock to queue direct deposit advice of deposits for printing from QuickBooks Desktop. Click Assign DD numbers to prevent direct deposits from being placed in the check-printing queue. You can still print pay stubs for your direct deposits. You can also indicate an alphanumeric number (for example, DD) up to 11 characters, which will be incremented and printed on direct deposit pay stubs. Check mark the name of employee(s) you want to pay. To edit employee paycheck information for one paycheck only, select the employee's name to access the Paycheck Details. You can do this to add payroll items temporarily or to modify amounts before creating the paycheck, too. If the employee uses Direct Deposit, verify that the Use Direct Deposit box is selected. Click Save & Next to go to the next employee, or select Save & Close to go back to the Enter Payroll Information window. When the checks are ready to be created, select Continue. From the Review and Create Paychecks window, review the Check/Direct Deposit printing options. Verify the amounts for each employee, and select Create Paychecks. Print the paychecks or pay stubs now or later if desired. See How to print paychecks and Print pay stubs for detailed steps. If you have QuickBooks Desktop Payroll Assisted or direct deposit paychecks, send your payroll information and direct deposit paychecks to Intuit. You must do this before 5:00 PM PT 2 banking days prior to the check date. This allows enough time for the processing of direct deposit funds as well as tax payments on your behalf. There is an important distinction between paycheck date and pay period dates. The date on which employees are paid, i.e., checks are distributed (pay day). The paycheck date is used to determine when payroll liabilities are due, based on deposit schedules. The pay period begin and end dates represent the period in which employees worked on earned wages. Because IRS rules are based on when wages are paid (not earned), any wages paid in January, regardless of the pay period, will be included in the new year's wages for tax deposit and reporting purposes (including annual W-2 Forms). Because pay period dates do not affect the timing of the tax deposit due dates or payroll tax reporting, it is not necessary to correct these dates for tax purposes once checks have been distributed.